Hakusan, Japan, February 14, 2013 – Eizo Nanao Corporation (TSE: 6737) today announced the release of the DuraVision FDS1703, a 17-inch monitor designed for security and surveillance. The FDS1703 combines superb image quality with long-term reliability. It comes equipped with an energy-saving LED backlight that consumes less power than CCFL backlights and is mercury-free. 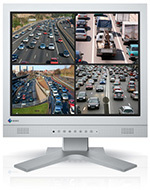 The monitor offers a 1280 x 1024 native resolution and can be viewed from a variety of positions with 160° horizontal and vertical viewing angles. The maximum brightness and contrast ratio are 350 cd/m2 and 800:1 respectively. The DuraVision FDS1703 comes with an analog D-Sub 15 pin input for connection to a computer and a composite (BNC) input for connection to video surveillance equipment such as closed-circuit televisions (CCTV) and security cameras. The composite input supports NTSC, PAL, and SECAM signals. To reduce ghosting and flicker, the composite input has a 3-dimensional Y/C separation circuit which separates the brightness signal (Y) from the color information signal (C), allowing the monitor to display high quality images with little noise. Compact dual-watt stereo speakers with RCA inputs are built in for audio capability. The stand has a 100 mm height adjustment range, 30° tilt, 70° swivel, and 90° pivot capability so that the screen can be adjusted to the ideal viewing position in any environment. A VESA-mount version (no stand) is also available for installations. In addition, the power supply is built in, so there is no separate power brick or cord. The DuraVision FDS1703 is now shipping. Date of availability varies by country so please contact the EIZO subsidiary or distributor in your country or territory for details.